But let me introduce you to some ladies who are truly trying to make themselves anew in a very big way. They are trying to remake themselves emotionally, physically, mentally, and spiritually…as they are healing from broken lives. My few extra pounds don’t even begin to compare with what these ladies have been through. These women have the opportunity to create healed identities through making amazing bags. While they are healing, they are learning a new trade! All of these bags are made of aguayo, an Andean wool cloth. Let me tell you, they are sturdy! They are lined with coordinating fabric and have interior pockets. I wouldn’t recommend this product if you are allergic to wool, but otherwise, they are awesome! I have had commercially made bags that didn’t hold up for more than a couple of weeks. These are beautifully crafted bags, and they are definitely for a good cause! They also carry market totes made of canvas and beautiful note cards. 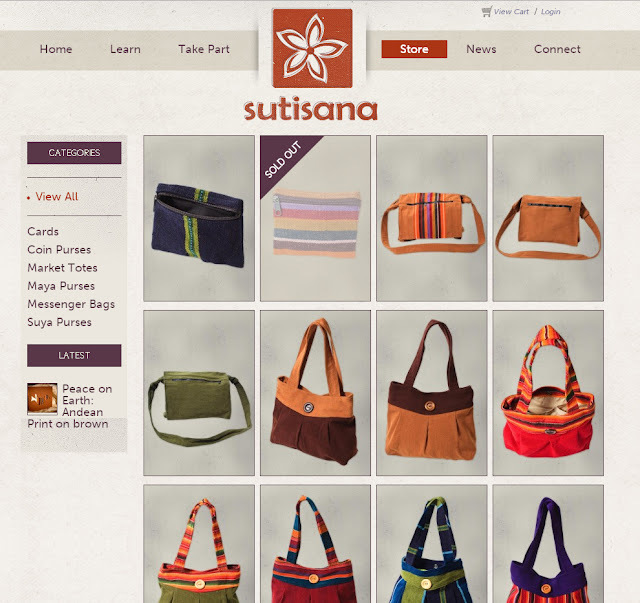 Please, if you have a little extra Christmas money jingling in your pockets, please go and check out Suti Sana. Their bags range in size from wallets to messenger bags, and the prices are very reasonable. If money is tight, I encourage you to pray for their ministry. These women are taking the first steps to a new life. Please note: I didn’t receive anything in payment for this post. I did buy an awesome bag, though! Cara didn’t even ask me to share this with you, but I volunteered. I want to show my girls how important it is to serve in small ways...and I can share this ministry with you as one small way.